At Pheim, our goal is to create investments that tie in with our clients’ defined financial goals, needs and risk profile. As such, the first stage of our relationship with our clients is to get to know our clients. Based on that understanding, we will seek to define the appropriate investment universe, benchmark and asset allocations that will reflect their return objective and risk tolerance level. 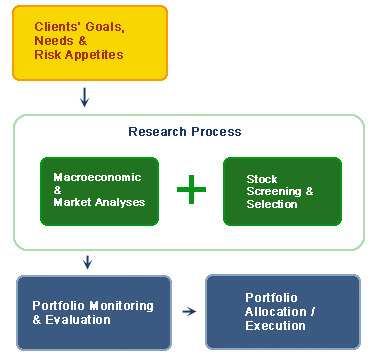 Our research process leverages on our in-depth market knowledge and broad research coverage, which includes a combination of top-down evaluation as well as bottom up analysis. Our top down asset allocation begins with an analysis of the macroeconomic and political outlook on a global and country basis. Factors that we review would include economic growth, inflation, interest rates, liquidity and the general investor sentiment. In addition, we would consider country specific factors like: the socio-political developments, population statistics, the real economy (GDP growth, inflation, unemployment, production output, exports and imports, inventory level), monetary (interest rates, money supply) and fiscal policies (government spending/budget, government debt), balance of payment (trade balance, current account balance) before we decide which countries to overweight or underweight. We review developments pertaining to individual sectors of the economy, including sector growth trends and prospects, relative valuations and business cycles that typify each industry. Other inputs include technology developments, state of competition in the industry, government policy on privatisation and infrastructural development, and consumer spending pattern. With the benefit of the macro perspective, and having formed our view on the relative country and sector weightings, we conduct our stock selection process. Stock selection is based on a meticulous process of screening based on quantitative as well as qualitative analyses. Some inputs we look into include valuations, NAV comparisons, management quality and transparency. Aside from adopting a top-down approach to our process, we also believe in a strong bottom-up emphasis to develop our portfolio allocation. At Pheim, we advocate a value approach to investing. We focus on depressed stocks that are backed by good fundamentals, but are temporarily out of favor. In a nutshell, we seek stocks that are grossly undervalued. We evaluate a company based on quantitative as well as qualitative factors. We make extensive use of fundamental analysis. We particularly favor stocks that have strong balance sheet (low gearing and strong cash flow position), positive earning dynamics (strong earnings growth, dominant market position and pricing power) and possess attractive financial ratios (low price-to-earnings ratios, price-to-book ratios and high margins). We also conduct technical analysis to look out for stocks that are selling at a historical low. 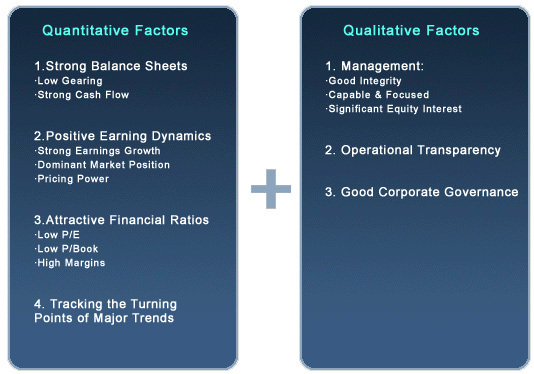 In our evaluation of a stock, we also consider qualitative factors. We favor companies whose management has good integrity, is capable and focused, and has significant equity interest in the companies. We also expect the companies to be transparent in their operations, and to have satisfactory corporate governance practices. Our fund manager/analysts conduct frequent meetings with company managements, including on-site company visits, to gain first hand understanding of the companies’ operations. This approach enables us to gain in-depth appreciation of the companies’ business so that we are better able to assess the quality of their management. Last, but not least, the prevailing investor psychology is also another factor that we take into account. Just as buy decisions are critical, we believe that the timing of the sell decisions is equally important. A sell decision is usually triggered in the following circumstances: (1) material adverse changes in a country’s socio-political developments or economic and sector outlook; (2) material adverse changes in company fundamentals, such as expectation of material decline in earnings or severe deterioration in financial conditions; (3) fundamental changes in management or business focus; (4) announcement of corporate actions or transactions that are detrimental to interest of minority shareholders; (5) prices have appreciated materially ahead of intrinsic value or command significant premium over comparable shares and which is not supported by fundamentals. Often, this calls for professional judgment. Backed by our long experience, our long historical perspective of financial markets, a disciplined adherence to fundamental considerations, a good understanding of investor psychology and market dynamics will enable us to be better equipped at making such calls. At Pheim, we believe that active asset allocation can provide a likely booster to the performance of a fund without it having to take on unnecessarily high risk. Owing to the volatility of emerging markets, we do not believe in being fully invested at all times. Rather, we trim our equity exposure when we believe that the market is nearing its peak in order to preserve capital. Conversely, we seek to be fully invested when we believe that the market is near its bottom (i.e. trough). Having identified a stock for investment, we would decide on portfolio allocations. Generally, we would allocate the stock across our portfolios; subject to adjustments to take into account each client investment objectives and risk profiles, and portfolio liquidity, and compliance with applicable investment limits and restrictions. Stock transactions will be executed by our fund managers/analysts for their respective markets, subject to our in-house policies and rules on risk management controls. Our fund managers/analysts monitor the performance of stocks in the various portfolios. Our Investment Committee reviews stock and market performance, portfolio performance and portfolio risk measures, as well as compliance with investment restrictions at its weekly meetings. At Pheim, we strongly believe that good risk management and internal control is a critical component of our business and forms the foundation for a safe, sound and sustainable business. More importantly, a strong and effective system of internal procedures and control will help to ensure that the goals, needs and objectives of our clients are met. Our risk management and internal control system was designed primarily to address the spectrum of risks that our clients’ assets are likely to be exposed to. 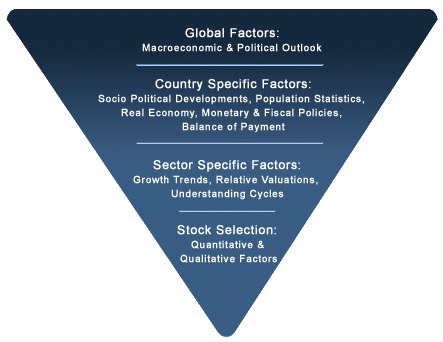 Those risk factors include market and position risk, counter party risk, liquidity risk, exchange rate risk and operational risk. As part of our portfolio risk monitoring, we also carry out regular review of our portfolio risk measures, including portfolio standard deviation, tracking error and information ratio. We believe that our risk management and internal control system, coupled with our policies of not engaging in proprietary trading as well as stringent control on staff dealings will ensure that clients’ interests are fully safeguarded. To date, we have not engaged in any legal disputes with any client or other party.